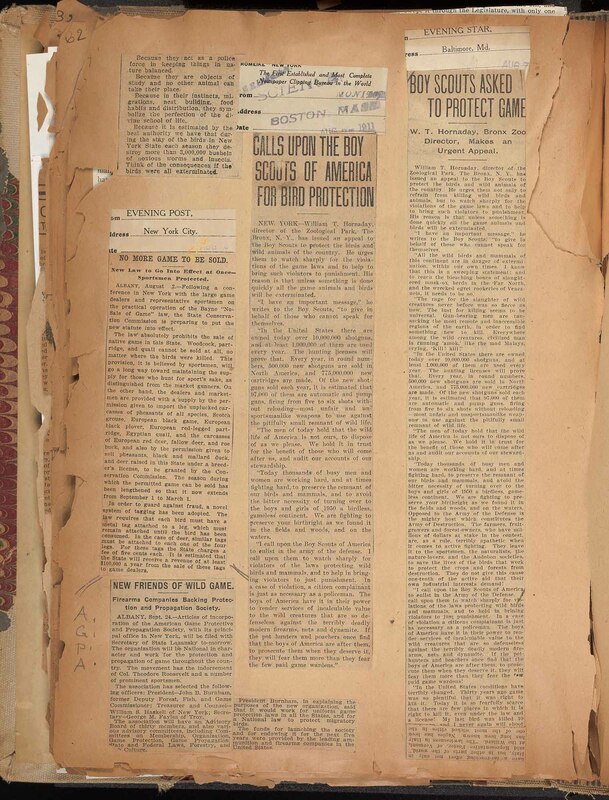 In 1911, William T. Hornaday was hard at work in his efforts to protect birds from unnecessary slaughter. 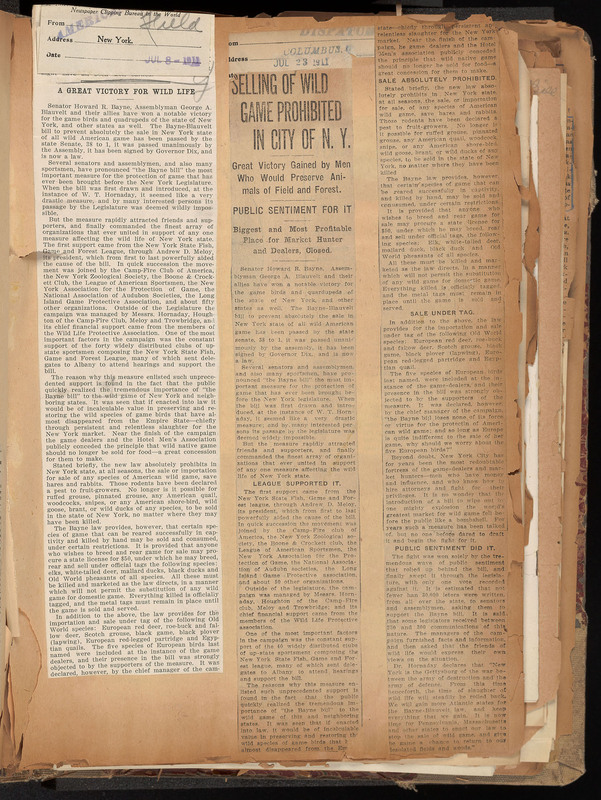 The Bayne-Blauvelt Bill (more commonly known as the Bayne Bill) to prevent the sale of wild American game in New York State had recently passed in July of 1911. The Bayne Bill, said by journalists at the time to be the most important measure for the protection of game brought before New York legislature, was a notable victory for Hornaday and wildlife conservationists alike. The law prohibited the sale and importation for sale of any species of wild game, regardless of where it may have been killed. The bill passed by the state senate 38 to 1 and unanimously by the assembly. However, there was still much to be done in the fight to protect wildlife. 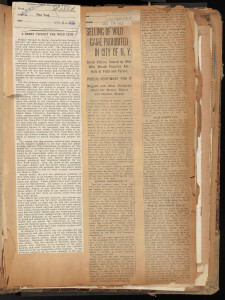 Articles announcing passage of the Bayne-Blauvelt Bill. In Hornaday Wildlife Scrapbook Collection, Vol. 3. WCS Archives Collection 1007. 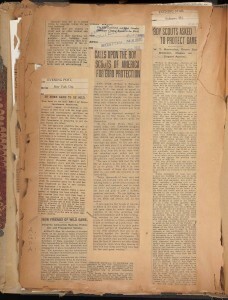 Articles on Hornaday’s calls to the BSA. In Hornaday Wildlife Scrapbook Collection, Vol. 3. WCS Archives Collection 1007. This post is by Sarah Cassone, graduate student in Library and Information Science at Palmer School at LIU Post. During Summer 2013, Sarah worked with the WCS Archives as a Metadata Cataloger on our Hornaday Wildlife Protection Campaign Scrapbook Project. In addition to serving as the first director of the Bronx Zoo, William T. Hornaday (1854-1937) was a pioneering force in the American wildlife conservation movement, and he spearheaded several lobbying and fundraising campaigns in support of wildlife. These campaigns he documented in scrapbooks, and the WCS Archives is now engaged in making many of these scrapbooks available online through the generous support of the Leon Levy Foundation. These scrapbooks are expected to be online in February 2014. In the meantime, posts like this one provide a preview, as well as some backstory, into the scrapbooks’ contents.